Local Crime Watch readers: when you're out and about in the next day or so, why not pick up a copy of the latest New Zealand Listener magazine, out today, and turn to page 34? For there you will find my new three-page feature article on the world's 'Greatest living crime writer' (as noted on the cover - right), Mr James Lee Burke. Now, before some of you get all huffy with me and start throwing around other names of other great crime writers, I'd just like to point out that it was a greater man than me, John Connolly, who called Burke thus at the recent crime writing festival in Harrogate. And as Connolly said, "you can disagree with me, but you'd be wrong". It was an absolute pleasure to interview Burke, again, this year. He's been one of my all-time favourite crime writers for more than a decade, and he's so interesting to talk to. We spent an hour chatting about everything from Greek tragedy and Elizabethan theatre to the nature of war throughout history to the environmental cost of energy exploration, US politics, the plight of the underclass, reality TV as the modern version of the Roman circus, the nature of art, and much more. We were, of course, meant to be talking about his latest Dave Robicheaux book, CREOLE BELLE, released this month (it's excellent - get your hands on it). But Burke is one of those authors who'd rather just chat about interesting things, than just push his latest book. He's an amazingly intelligent, thoughtful, fascinating, and opinionated man. Humble and generous with his time, he's one of those people that you get off the phone from talking with, and you just feel like 'man, how lucky am I to do this for a job'? Of course, he's a hell of a writer too. I've had some very nice feedback about the feature already, which is humbling - I just hope it does Jim justice. 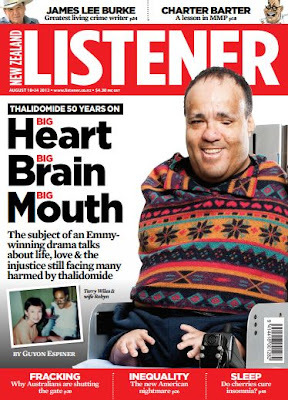 Go grab a copy of the Listener, and let me know what you think. I hope you like it too. Well done you, Craig - I hope they'll put the interview up online or grant you permission to post it; I'd live to read it. Have to agree with you Craig, JLB is right up there for me too. As a prospective Kiwi (about 3 years hence I'll be relocating to Marlborough) I'm enjoying tuning into your page, great reviews and interviews. How can I get you to take a look at my book - PRIME CUT - 2011 Ned Kelly winner for Best First Fiction?